Caspofungin acetate, a semisynthetic lipopeptide synthesized from a fermentation product of Glarea lozoyensis, is an echinocandin antifungal agent. The drug is a glucan synthesis inhibitor and differs structurally and pharmacologically from other currently available antifungal agents. Caspofungin inhibits the synthesis of b(1,3)-d-glucan, an integral component of the fungal cell wall that is not present in mammalian cells. Caspofungin is active in vitro against Aspergillus fumigatus, A. flavus, and A. terreus. Caspofungin therapy has been associated with prolonged survival in both immunocompetent and immunosuppressed rodents when initiated as long as 24 hours after evidence of disseminated or pulmonary Aspergillus fumigatus infection. Plasma caspofungin concentrations decline in a polyphasic manner following IV infusion of the drug over 1 hour. The drug is extensively (about 97%) protein bound (to albumin), with distribution (rather than excretion or biotransformation) being the predominant mechanism influencing plasma clearance. Caspofungin is slowly metabolized in the liver via hydrolysis and N-acetylation; 35 and 41% of the parent drug and metabolites were excreted in feces and urine, respectively, following a single IV radiolabeled dose. Caspofungin is a poor substrate for, and does not inhibit or induce, cytochrome P-450 isoenzymes in vitro. However, coadministration of caspofungin with certain inducers of drug clearance and/or mixed inducer/inhibitors may result in clinically important reductions in plasma caspofungin concentrations. 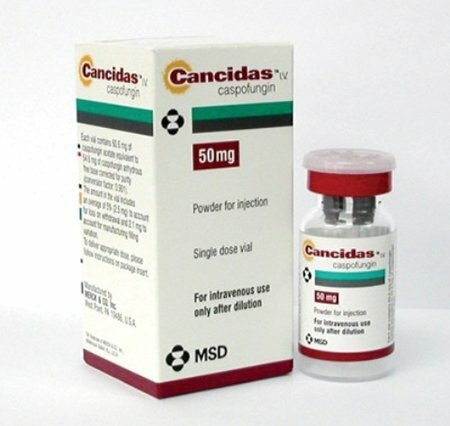 Caspofungin acetate is used for the treatment of invasive aspergillosis in patients whose disease is refractory to, or who are intolerant of, other antifungal agents (i.e., conventional amphotericin B or lipid-based amphotericin B preparations and/or itraconazole); the drug has not been studied as first-line therapy for such infections. The current FDA-labeled indication is based principally on the results of an open-label, noncomparative study involving 69 patients 18-80 years of age with definite or probable invasive aspergillosis. Study patients consisted of those whose infection had previously been categorized as refractory (i.e., no improvement or progression despite at least 7 days of therapy with amphotericin B [conventional or lipid-based preparations], itraconazole, or an investigational azole antifungal with activity against Aspergillus spp.) or who were intolerant (i.e., doubling of serum creatinine concentration or serum creatinine 2.5 mg/dL or greater while on therapy, infusion-related toxicities, or other acute reactions) of other treatments. 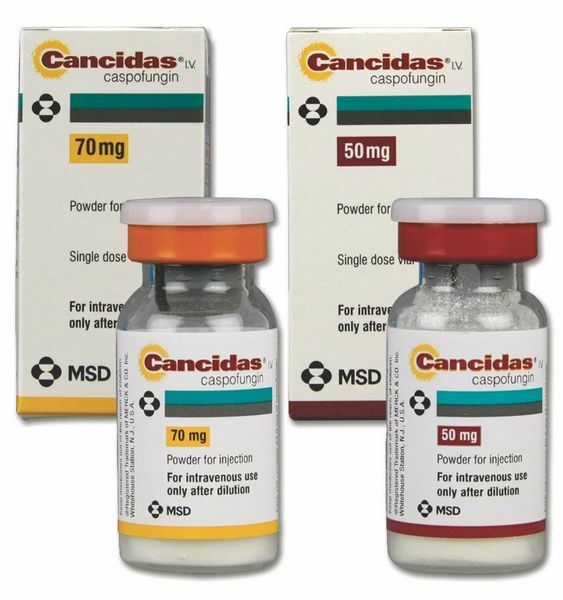 A favorable response (defined as complete resolution or clinically meaningful improvement of all manifestations and related radiographic findings) was observed in 41% of patients receiving at least one dose and in 50% of patients receiving greater than 7 days of therapy with caspofungin (mean duration of therapy: 33.7 days; range: 1-162 days). Caspofungin therapy was associated with favorable response rates in 36% of patients refractory to other therapies and in 70% of patients intolerant of other therapies. The efficacy of caspofungin versus other antifungal agents for the treatment of invasive aspergillosis has not been evaluated in comparative clinical studies. Caspofungin is administered by slow IV infusion over approximately 1 hour. The drug should not be admixed or infused concomitantly with other drugs. Dextrose-containing diluents (e.g., 5% dextrose injection) should not be used. Commercially available caspofungin acetate lyophilized powder for injection should be stored at 2-8 °C. Prior to reconstitution, the vial should be allowed to reach room temperature. (1) The contents of the 50- or 70-mg vial should be reconstituted by adding the appropriate volume of 0.9% sodium chloride injection; the manufacturer’s prescribing information should be consulted for details on reconstitution of caspofungin acetate. The commercially available vials are formulated to provide the full labeled doses (50 or 70 mg) when reconstituted as directed. The vial should be mixed gently until the drug is dissolved completely, and the reconstituted solution inspected for evidence of particulate matter or discoloration prior to infusion. The reconstituted vial may be stored at a temperature of 25°C or less for up to 1 hour prior to preparation of the IV infusion. Once prepared, the IV solution may be stored at a temperature of 25°C or less for 24 hours. The appropriate dose of reconstituted drug should be withdrawn from the vial and added to 250 mL of 0.9% sodium chloride injection. For patients requiring fluid restriction, 100 mL of 0.9% sodium chloride injection may be used as a diluent for the drug. The recommended dosage of caspofungin acetate in adults with invasive aspergillosis whose disease is refractory to, or who are intolerant of, other antifungal therapy is 70 mg given by slow IV infusion as a loading dose on day 1, followed by 50 mg daily by slow IV infusion thereafter. The duration of caspofungin treatment is based on the severity of the patient’s underlying disease states, recovery from immunosuppression, and clinical response. While clinical experience is limited regarding therapy duration exceeding 2 weeks, available data suggest that caspofungin continues to be well tolerated with longer courses of therapy (i.e., a few patients have been treated for up to 162 days). When caspofungin acetate is given concomitantly with drugs known to induce its clearance,an increase in the daily dosage to 70 mg (following the usual loading dose) should be considered in adults who are not clinically responding to 50 mg daily. However, the efficacy of a 70-mg daily dosage in adults who have not responded to the usual dosage is not known. The safety and efficacy of caspofungin acetate dosages exceeding 70 mg daily have not been adequately studied. No dosage adjustment necessary in adults with mild hepatic impairment (Child-Pugh score 5-6). Adults with moderate hepatic impairment (Child-Pugh score 7-9) should receive 35 mg of caspofungin acetate daily following the initial 70-mg loading dose. Caution should be exercised in dosing adults with severe hepatic impairment (Child-Pugh score exceeding 9) because of a lack of clinical experience in this patient population. Dosage adjustments are not necessary because of gender, advanced age (i.e., 65 years of age or older), race (i.e., whites, blacks, Hispanics), or renal impairment. Caspofungin is not dialyzable, and supplementary dosing is not required following hemodialysis. Known hypersensitivity to caspofungin acetate or any ingredient in the formulation. Transient elevations in ALT (SGPT) to 2-3 times the upper limit of normal, and more moderate increases in AST (SGOT) have occurred with concomitant use of caspofungin and cyclosporine.The manufacturer states that use of this drug combination is not recommended unless the potential benefit outweighs the potential risk to the patient. Dosage reduction in patients with moderate hepatic impairment is recommended; no clinical experience in patients with severe hepatic impairment. Possible histamine-mediated symptoms (e.g., rash, facial swelling, pruritus, sensation of warmth) and at least one case of anaphylaxis (i.e., dyspnea, stridor, worsening of rash during initial administration of caspofungin) reported. Not known whether clinical isolates of Aspergillus spp. may develop resistance to caspofungin. In limited clinical experience, drug resistance in patients with invasive aspergillosis was not observed. Caspofungin is distributed into milk in rats; not known whether caspofungin is distributed into milk in humans. Caution should be exercised if caspofungin is used in nursing women. Pediatric Use Safety and efficacy not established in children and adolescents younger than 18 years of age. Limited clinical experience; pharmacokinetic, efficacy, and adverse effect profiles similar to those in younger adults. Hepatic Impairment Dosage reduction recommended in patients with moderate hepatic impairment; clinical experience lacking in patients with severe hepatic impairment. Adverse effects occurring in 2% or more of patients with invasive aspergillosis receiving caspofungin acetate in an open-label, noncomparative clinical study include fever, infused vein complications, nausea, vomiting, or flushing. Fever, phlebitis/thrombophlebitis, infused vein complication, headache, nausea, pain (unspecified), rash, anemia, abdominal pain, diarrhea, vomiting, facial edema, flu-like illness, myalgia, paresthesia, induration, chills, and pruritus reported in clinical studies for uses other than aspergillosis. Potential pharmacokinetic interaction (increased bioavailability [AUC] of caspofungin). No increase in plasma cyclosporine concentrations, but transient elevations in ALT (SGPT) and AST (SGOT) reported with concomitant use of caspofungin and cyclosporine. Potential pharmacokinetic interaction (reduction in blood concentration and AUC of tacrolimus). Routine monitoring of blood tacrolimus concentrations and appropriate dosage adjustments recommended. No pharmacokinetic interaction observed with amphotericin B (any formulation), itraconazole, or mycophenolate. Potential pharmacokinetic interaction (reduction in caspofungin plasma concentrations.). Coadministration of caspofungin with inducers or mixed inducer/inhibitors of drug clearance such as efavirenz, nelfinavir, nevirapine, phenytoin, rifampin, dexamethasone, or carbamazepine may result in clinically important reductions in plasma caspofungin concentrations. An increase in the caspofungin maintenance dosage to 70 mg daily (following the usual 70-mg loading dose) should be considered if inadequate clinical response occurs in patients receiving any of these drugs concomitantly with caspofungin. Importance of women informing clinicians if they are or plan to become pregnant or are breast-feeding. Importance of informing clinicians of existing or contemplated concomitant therapy, including prescription and OTC drugs.